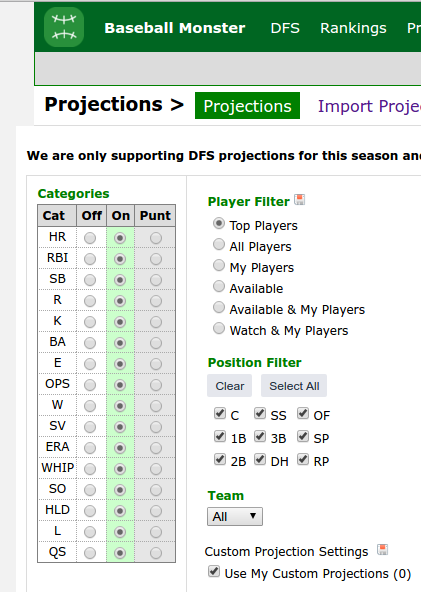 I checked your import CSV for pitchers, and it looks a little odd. It seems to have L/R and the innings are high (>800). Are you sure the format is correct? Sorry, I should have checked my own data first! I wrote a script that imports the raw data from my projection source and outputs a .csv in the format that your projection importer requires. 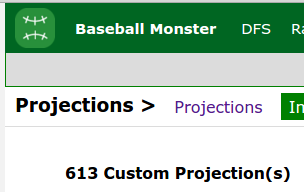 When it executed without any errors and appeared to import successfully into Baseball Monster, I incorrectly assumed the data wasn't at issue. In fact, my project source apparently added that R/L column this week, which through off all the columns in my .csv. After removing that column and reprocessing, import succeeded and I can access the projections now.